Can Solar Shades Be Motorized? FAQ: Solar shades: can they be motorized? Solar shades can be motorized by inserting one of our tubular motors into the existing roller tubing. Our special 'mini' motor fits roller tubing with an inside diameter of 3/4" (18mm) or more. You can also replace the roller tubing with a larger size that accepts one of our standard or heavy duty 12v motors. Our 12v DC low voltage motors are safe for children and adults, and you do not need to be an electrician to install one (perfect for DIY). Our radio equipped motors use RF (Radio Frequency) signals for transmission of the remote control commands. A small antenna in the motor receives the control signal and on-board circuitry decodes the command and activates the motor. This system is different from the infrared signal used on most television sets. The RF signal is not directional, so you do not have to point the remote at the roller shade or blind, and it is also capable of passing through walls, reaching almost anywhere inside a typical home. 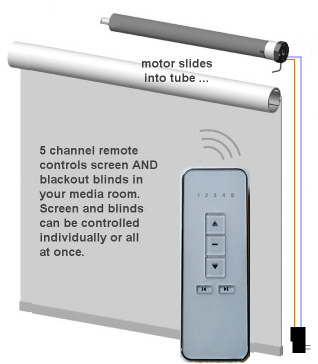 Our multi-channel remotes can be programmed to control solar shade motors in various different rooms and hallways throughout the house. Solar shades can be installed with dual rollers, making the shade material selectable, depending on time of day and lighting conditions. You could use blackout blinds at night and translucent shades during the daytime.